When a liberal, white middle-class couple with young kids moved to Omaha from Chicago in the late 1950s they entered this city’s weirdly segregated reality, not uncommon in almost every American city. It was not as public or overtly violent as the segregation in the former Confederate states of the South, but it was no less impactful on the African-American communities in Northern states. Homemaker Lois Mark Stalvey was a former advertising copywriter who once owned her own agency. Her husband Bennett Stalvey was a Fairmont Foods Mad Man. The Omaha they settled into abided by a de facto segregation that saw blacks confined to two delineated areas. The largest sector, the Near North Side, was bounded by Cuming on the south and Ames on the north and 16th on the east and 40th on the west. Large public housing projects were home to thousands of families. In South Omaha blacks were concentrated in and around projects near the packing plants. Blacks here could generally enter any public place – a glaring exception being the outdoor pool at Peony Park until protestors forced ownership’s hand – but were sometimes required to sit in separate sections or limited to drive-thru service and they most definitely faced closed housing opportunities and discriminatory hiring practices. Though only in Omaha a few years, Stalvey made her mark on the struggle for equality then raging in the civil rights movement. The well-intentioned wife and mother entered the fray naive about her own white privilege and prejudice and the lengths to which the establishment would go to oppose desegregation and parity. Her headstrong efforts to do the right thing led to rude awakenings and harsh consequences. Intolerance, she learned here and in Philadelphia, where the Stalveys moved after her husband lost his job due to her activism, is insidious. All of which she wrote about in her much discussed 1970 book, The Education of a WASP. The title refers to the self-discovery journey she made going from ignorance to enlightenment. Blacks who befriended her in Omaha and in Philadelphia schooled her on the discrimination they faced and on what was realistic for changing the status quo. Among her primary instructors was the late black civic leader and noted physician Dr. Claude Organ and his wife Elizabeth “Betty” Organ and a young Ernie Chambers before his state senator career. In WASP Stalvey only sparingly used actual names. The Organs became the Bensons and Chambers became Marcus Garvey Moses. A Marshall, Texas native and graduate of Xavier University in New Orleans, Claude Organ was accepted by the University of Texas Medical School but refused admittance when officials discovered he was black. The state of Texas paid the tuition difference between UT and any school a denied black attended. Organ ended up at Creighton University and the state of Texas paid the extra $2,000 to $3,000 a year the private Jesuit school cost, recalls Betty Organ. His civil rights work here began with the interracial social action group the De Porres Club led by Father John Markoe. Organ became Urban League of Nebraska president and later advised the Citizens Coordinating Committee for Civil Liberties (4CL). He was on the Catholic Interracial Council board and Mayor’s Biracial Committee. “He built a lot of bridges,” son Paul Organ says. Betty Organ got involved, too, supporting “any group that had something to do with making Omaha a better place to live,” she says. So when Stalvey was introduced to the Organs by a black friend and determined to made them her guides in navigating the troubled racial waters, she couldn’t have found a better pair. Stalvey met Chambers through Claude Organ. Though it may not seem so now, Chambers says the book’s title was provocative for the time. WASP stands for White Anglo-Saxon Protestant, which defined Stalvey’s background, but racism was rampant across ethnic and religious lines in White America. But he admired the “substance” behind the sensation. He admired, too, that the vitally curious Stalvey asked lots of questions. His mother headed the progressive Omaha Panel for American Women that advocated racial-religious understanding. The diverse panelists were all moms and the Organ and Stalvey kids sometimes accompanied their mothers to these community forums. Paul Organ believes the panelists wielded their greatest influence at home. “On the surface all the men in the business community were against it. Stalvey’s efforts were not only public but private. She personally tried opening doors for the aspirational Organs and their seven children to integrate her white bread suburban neighborhood. She felt the northeast Omaha bungalow the Organs occupied inadequate for a family of nine and certainly not befitting the family of a surgeon. Racial segregation denied the successful professional and Creighton University instructor the opportunity for living anywhere outside what was widely accepted as Black Omaha – the area in North Omaha defined by realtors and other interests as the Near North Side ghetto. Despite the initial reluctance of the Organs, Stalvey’s efforts to find them a home in her neighborhood put her self-educating journey on a collision course with Omaha’s segregation and is central to the books’s storyline. Organ appreciated Stalvey going out on a limb. Stalvey and others were also behind efforts to open doors for black educators at white schools, for employers to practice fair hiring and for realtors to abide by open housing laws. Stalvey found like-minded advocates in social worker-early childhood development champion Evie Zysman and the late social cause maven Susie Buffett. They were intent on getting the Organs accepted into mainstream circles. Only the change happened either more gradually than Stalvey wanted or in ways she didn’t expect. Despite her liberal leanings Claude Organ remained wary of Stalvey. Ernie Chambers says Stalvey’s willingness to examine and question things most white Americans accepted or avoided was rare. The two forged a deep connection borne of mutual respect. “She was surprised I knew what I knew, had read as widely as I had, and as we talked she realized it was not just a book kind of knowledge. In Omaha for a black man to stand up was considered remarkable. Chambers still fights the good fight here. Though he and Claude Organ had different approaches, they became close allies. Stalvey’s attempts to infiltrate the Organs into Rockbrook were rebuffed by realtors and residents – exactly what Claude Organ warned would happen. He also warned her family might face reprisals. Bennett Stalvey was demoted by Fairmont, who disliked his wife’s activities, and sent to a dead-end job in Philadelphia. The Organs regretted it came to that. While that drama played out, Claude Organ secretly bought property and secured a loan through white doctor friends so he could build a home where he wanted without interference. The family broke ground on their home on Good Friday in 1964. The kids started school that fall at St. Philip Neri and the brick house was completed that same fall. “We had the house built before they (opponents) knew it,” Betty Organ says. Their spacious new home was in Florence, where blacks were scarce. Sure enough, they encountered push-back. A hate crime occurred one evening when Betty was home alone with the kids. “Somebody came knocking on my door. This man was frantically saying, ‘Lady, lady, you know your house is one fire?’ and I opened the door and I said, ‘What?’ and he went, ‘Look,’ and pointed to something burning near the house. I looked out there, and it was a cross burning right in front of the house next to the garage. When the man saw what it was, too, he said, ‘Oh, lady, I’m so sorry.’ It later turned out somebody had too much to drink at a bar called the Alpine Inn about a mile down the road from us and did this thing. Paul Organ was 9 or 10 then. As the only black family in St. Philip Neri Catholic parish the Organs seriously tested boundaries. Daughter Sandra Organ says, “There were some tensions there. Dad would talk about how to handle these kind of things and to take the high road. But if they used the ‘n’ word we had an opportunity to retaliate because you defend your honor as a black person. Stalvey came from Philadelphia to visit the Organs at their new home. “When she saw the house we built she was just thrilled to death to see it,” Betty Organ says. In Philadelphia the Stalveys lived in the racially mixed West Mount Airy neighborhood and enrolled their kids in predominantly African-American inner city public schools. His mother began writing pieces for the Philadelphia Bulletin that she expanded into WASP. In the wake of WASP she became a prominent face and voice of white guilt – interviewed by national news outlets, appearing on national talk shows and doing signings and readings. Meanwhile, her husband played a key role developing and implementing affirmative action plans. Noah Stalvey says any negative feedback he felt from his parents’ activism was confined to name-calling. He says the work his parents did came into focus after reading WASP. Betty Organ thought WASP did a “pretty good” job laying out “what it was all about” and was relieved their real identities were not used. After all, she says, he had a career and family to think about. Dr. Claude Organ went on to chair Creighton’s surgery department by 1971, becoming the first African-American to do so at a predominately white medical school. He developed the school’s surgical residency program and later took positions at the University of Oklahoma and University of California–Davis, where he also served as the first African-American editor of Archives of Surgery, the largest surgical journal in the English-speaking world. 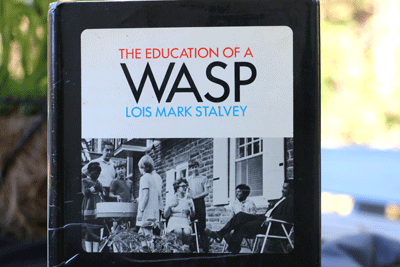 Stalvey followed WASP with the book Getting Ready, which chronicled her family’s experiences with urban black education inequities. At the end of WASP she expresses both hope that progress is possible – she saw landmark civil rights legislation enacted – and despair over the slow pace of change. She implied the only real change happens in people’s hearts and minds, one person at a time. She equated the racial divide in America to walls whose millions of stones must be removed one by one. And she stated unequivocally that America would never realize its potential or promise until there was racial harmony. Forty-five years since WASP came out Omaha no longer has an apparatus to restrict minorities in housing, education, employment and recreation – just hardened hearts and minds. Today, blacks live, work, attend school and play where they desire. Yet geographic-economic segregation persists and there are disproportionate numbers living in poverty. lacking upwardly mobile job skills, not finishing school, heading single-parent homes and having criminal histories in a justice system that effectively mass incarcerates black males. Many blacks have been denied the real estate boom that’s come to define wealth for most of white America. Thus, some of the same conditions Stalvey described still exist and similar efforts to promote equality continue. Stalvey went on to teach writing and diversity before passing away in 2004. She remained a staunch advocate of multiculturalism. When WASP was reissued in 1989 her new foreword expressed regret that racism was still prevalent. And just as she concluded her book the first time, she repeated the need for our individual and collective education to continue and her indebtedness to those who educated her. Noah Stalvey says her enduring legacy may not be so much what she wrote but what she taught her children and how its been passed down. Ben Stalvey says his mother firmly believed children are not born with prejudice and intolerance but learn these things. “There’s a song my mother used to quote which I still like that’s about intolerance – ‘You’ve Got to be Carefully Taught’ – from the musical South Pacific.